Results are in: Scotland says NO to Independence from U.K.
WASHINGTON — Ukraine agreed to and ratified a recent deal, brokered by the European Union (EU), that would blunt the independence movement by pro-Russia and Russia-backed separatist rebels in eastern Ukraine. Reuters reported Ukrainian President Petro Poroshenko offered the rebels temporary and limited self-rule within Ukraine, but the rebels rebuffed the agreement and denounced it as a Western ploy. Even with a ceasefire in place, three Ukrainian servicemen were killed in sporadic fighting in the east. 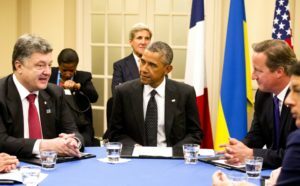 Poroshenko told the Ukrainian parliament, “No nation has ever paid such a high price to become Europeans.” Poroshenko was referring to how his predecessor, the pro-Russia Viktor Yanukovich, did not sign a deal with the EU last November and instead tried to solidify ties with Ukraine’s old Soviet overseer, Russia. Yanukovich has since fled to Russia after street protests spread like wildfire throughout the country, but Russia invaded the southern, Black Sea region of Crimea soon after and annexed it. Russia has since backed the eastern rebels against the government in Kiev, and officially denies such involvement.